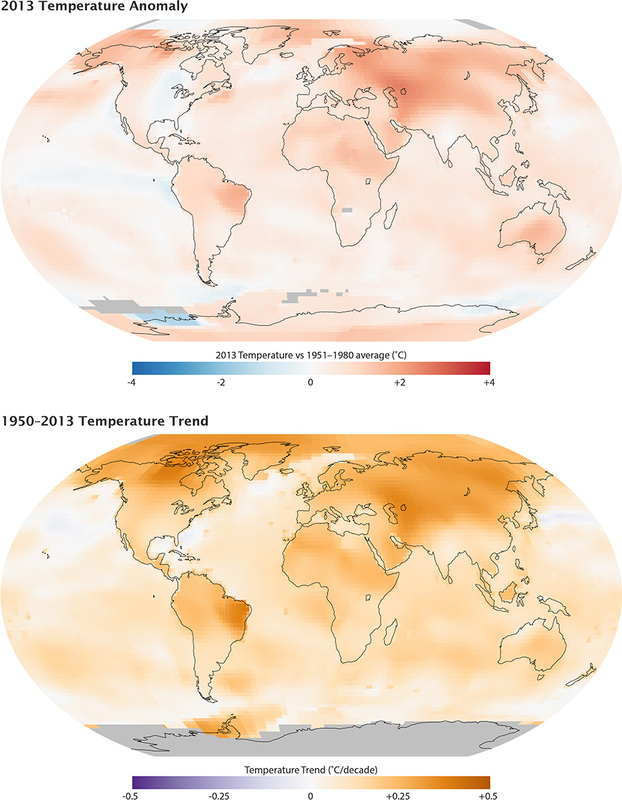 NASA's Goddard Institute for Space Studies (GISS) in New York, which analyzes global surface temperatures on an ongoing basis, released an updated report Tuesday on temperatures around the globe in 2013. The comparison shows how Earth continues to experience temperatures warmer than those measured several decades ago. The average temperature in 2013 was 58.3 degrees Fahrenheit (14.6 degrees Celsius), which is 1.1 °F (0.6 °C) warmer than the mid-20th century baseline. The average global temperature has risen about 1.4 °F (0.8 °C) since 1880, according to the new analysis. Exact rankings for individual years are sensitive to data inputs and analysis methods. Carbon dioxide is a greenhouse gas that traps heat and plays a major role in controlling changes to Earth's climate. It occurs naturally and also is emitted by the burning of fossil fuels for energy. Driven by increasing man-made emissions, the level of carbon dioxide in Earth's atmosphere presently is higher than at any time in the last 800,000 years. The carbon dioxide level in the atmosphere was about 285 parts per million in 1880, the first year in the GISS temperature record. By 1960, the atmospheric carbon dioxide concentration, measured at the National Oceanic and Atmospheric Administration's (NOAA) Mauna Loa Observatory in Hawaii, was about 315 parts per million. This measurement peaked last year at more than 400 parts per million. This article was originally prepared as NASA Headquarters release No. 14-024.